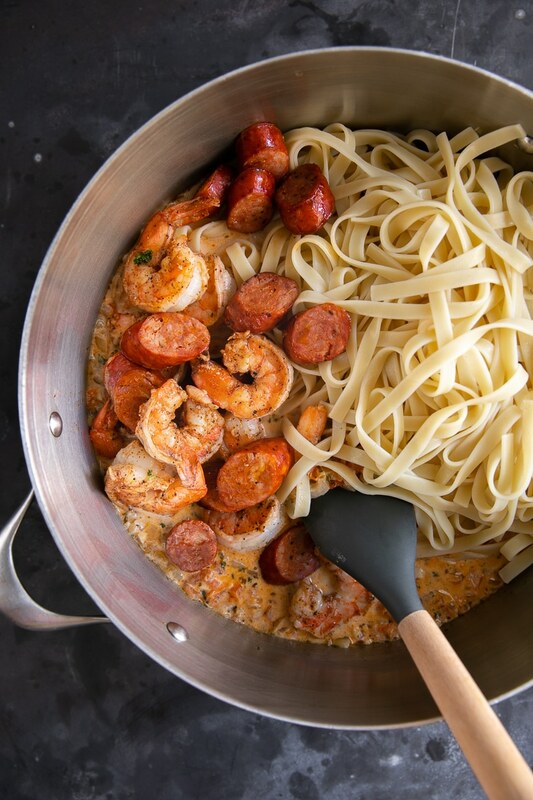 Smothered in a rich and luscious cream sauce, this Creamy Cajun Shrimp Pasta is made with juicy, tender shrimp and spicy Andouille sausage. Ready in just 30-minutes, this delicious Cajun Pasta comes together in a snap and is guaranteed to be your new favorite pasta dish. It’s no secret that I have a soft spot for Cajun food. 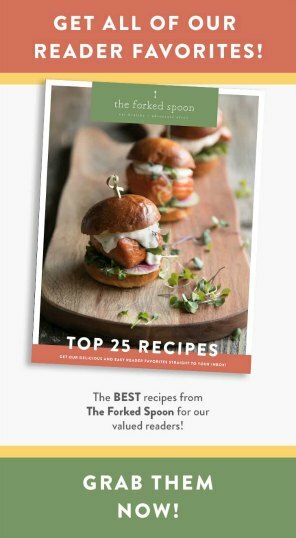 From the classics, like Jambalaya and Gumbo, to recipes made on a whim like these Cajun Shrimp Foil Packets or this Cajun Chicken and Rice Bake, New Orleans cuisine, it seems, is always on my mind. 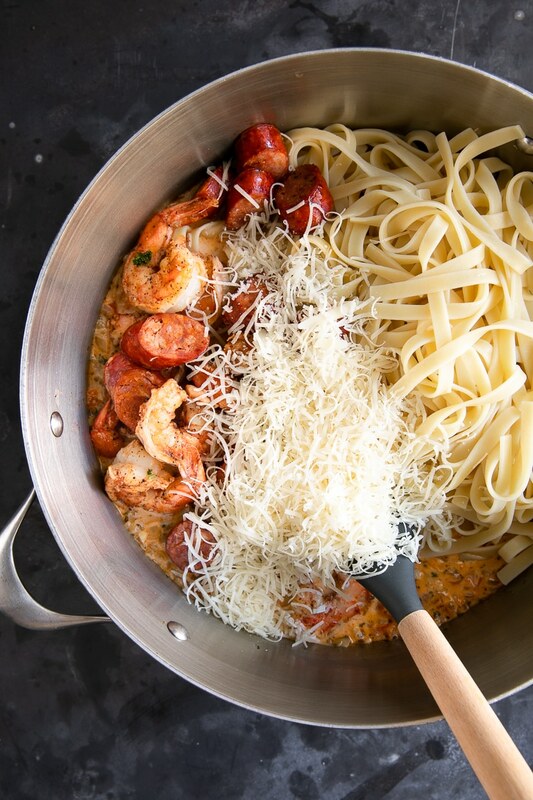 It only makes sense then that I combine all the buttery, creamy, richness of alfredo sauce with the out-of-this-world flavors of Cajun spices to make the very best Creamy Cajun Shrimp Pasta. 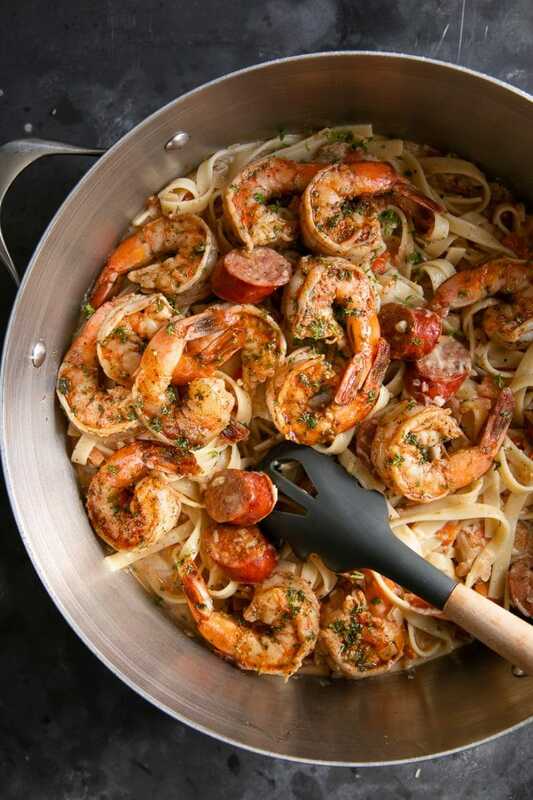 Filled with spicy smoked andouille sausage, juicy cajun-seasoned shrimp, and creamy fettuccini noodles, this is one pasta recipe you won’t be able to get enough of. 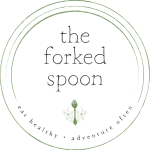 Unless you’ve tried Cajun or Creole food at least once or twice before, you may be wondering what Cajun food is or what I mean about its out-of-this-world flavors. Cajun cuisine was developed by the French-speaking Acadian people deported by the British from Canada to Louisiana (long history here) in 1755. 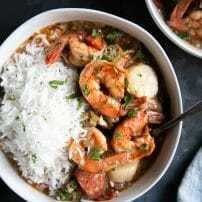 Made with local ingredients, Cajun food is considered, at least by some, to be rustic and somewhat less unrefined than Creole cuisine (very similar though typically less spicy). 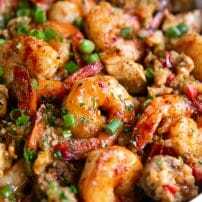 Popular ingredients in Cajun cooking include crawfish, shrimp, and andouille sausage, in addition to bell peppers, celery, green onions, okra, parsley, tomatoes, and cayenne peppers. Cajun seasoning (recipe coming soon) is a simple, yet hugely flavorful combination of salt, garlic powder, onion powder, black pepper, cayenne, and oregano. 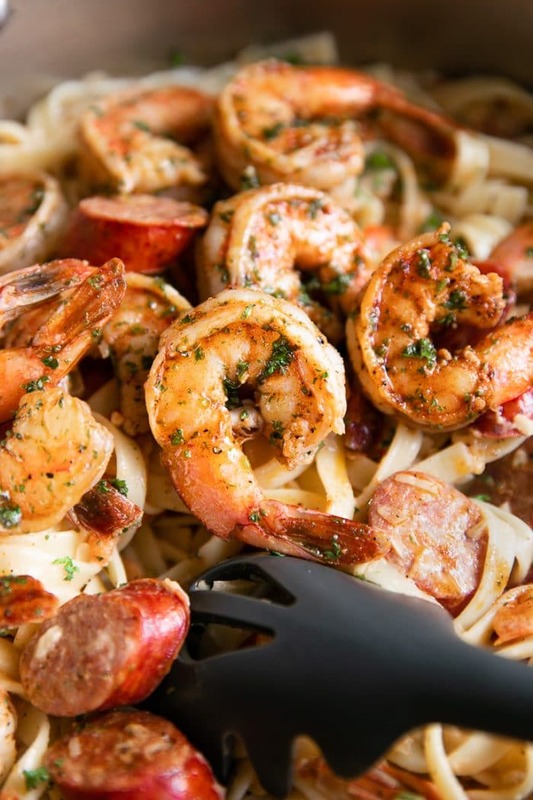 This Cajun Shrimp Pasta, as you may imagine, is probably not a recipe you would have found the Acadian people cooking up 250 years ago. 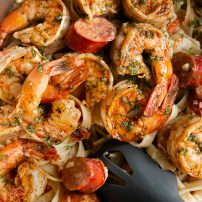 That said, it has many of the ingredients you would have found in traditional Cajun cuisines such as shrimp, andouille sausage, bell pepper, onion, tomatoes, and Cajun seasoning. Shrimp. In this particular recipe, I decided to make shrimp the star so I splurged and purchased big, fat, jumbo prawns. Of course, any size shrimp will do, just be sure to adjust cooking time accordingly as overcooked shrimp are no good. I also added andouille sausage for a little extra kick. Feel free chicken or beef, if preferred. Cajun Seasoning. Homemade or store-bought, Cajun seasoning is a must. That said, keep in mind that all Cajun seasoning mixes vary in heat levels. So, if you’re sensitive to spicy foods, I highly recommend starting with half the recommended amount of seasoning (this is not a mild pasta dish) and adding more at the end, if desired. Mirepoix. Not quite the “holy trinity” of Cajun cuisine as I left out the celery, the mirepoix in this Creamy Shrimp Pasta does contain onion, bell pepper, and garlic. You can chop your bell pepper into big chunks or dice them nice and small- entirely up to you. Tomatoes. I had a whole bag of fresh Roma tomatoes that needed to be used, so I ended up using those. However, feel free to add a large can of diced tomatoes or a mix of each, if you prefer. Pasta. 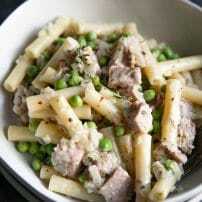 I used fettuccini pasta here which is great, but next time I will definitely use penne or bowtie pasta. I love fettuccini noodles, but it’s so much easier to handle leftover pasta noodles when they’re short and fat or in some sort of tube shape. Cream. I used full-fat cream. It’s not every day that I make a creamy, sinfully good pasta, so when I do, I do it right. Could you use half-and-half? Yes. Do I recommend anything less heavy (aka less fattening) than cream or half-and-half? No. Parmesan cheese. As part of the creamy sauce and as a topping, parmesan is always a good idea when pasta noodles are involved. 1. Marinate the shrimp. Add your shrimp to a medium mixing bowl and drizzle with 1-2 tablespoons of olive oil, Cajun seasoning, and dried oregano. If you are sensitive to spicy food, or you’re unsure how spicy your Cajun seasoning blend is, cut the total amount in half, or omit from the shrimp entirely. You can always add more later, if necessary. 2. Cook the sausage first…then the shrimp. Heat a large cast iron skillet over high heat and drizzle with olive oil. 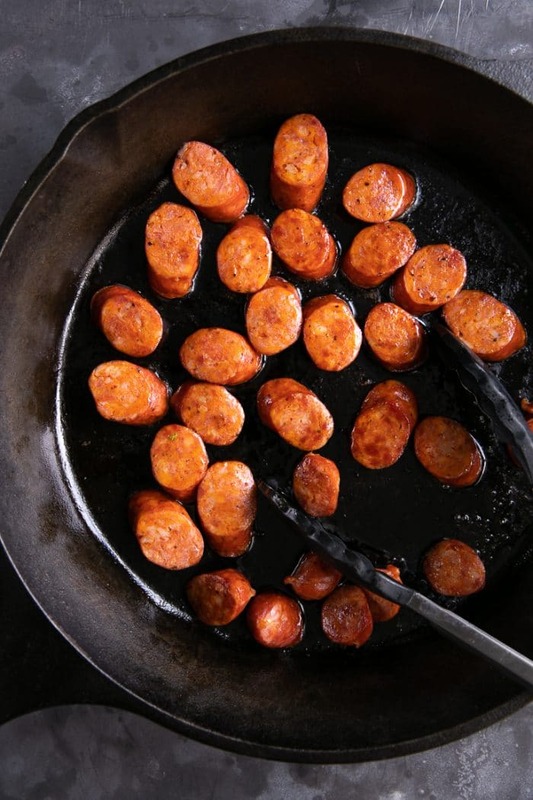 Add the sausage in a single layer and cook each side for approximately 2 minutes. Remove the sausage to a clean plate and set aside. Add the shrimp to the same skillet and cook over medium-high heat in a single layer for approximately 2 minutes per side. Cooking time will vary depending on the size of your shrimp so keep an eye on them. Remove the shrimp to a clean plate. 3. Bring a large pot of salted water to a boil over high heat. 4. 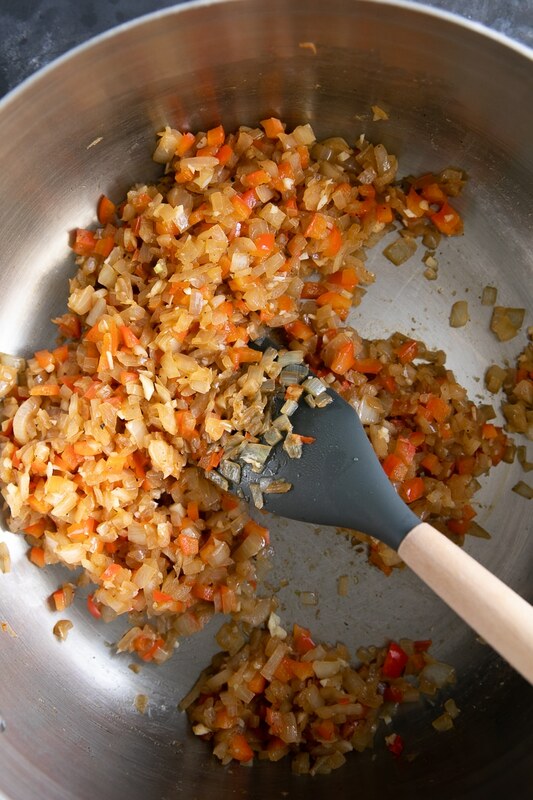 Cook the Mirepoix. Return the skillet to medium heat. Add a bit more olive oil and the onions to the skillet. Mix well and cook the onions for 3-4 minutes, stirring often. 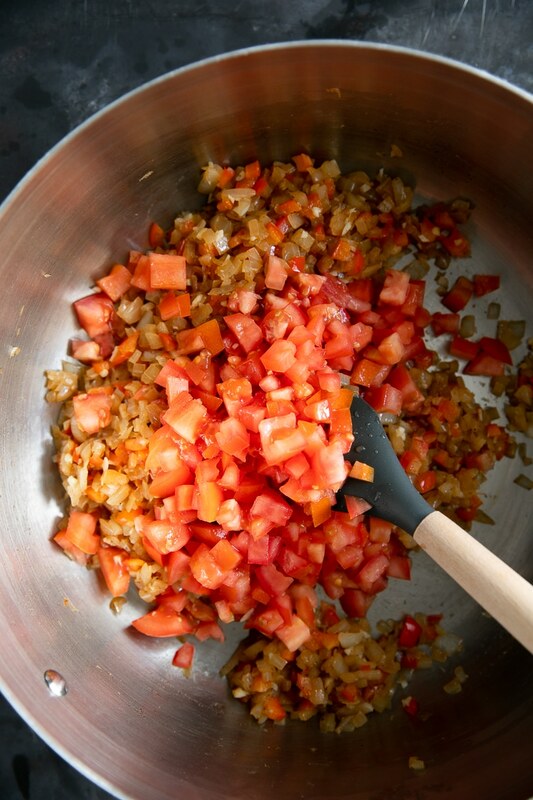 Add the diced bell pepper and continue to cook for an additional 2-3 minutes, stirring often. Add the garlic and cook for 30 seconds, stirring continuously. 5. Add the seasoning and tomatoes. Add the Cajun seasoning and the diced tomatoes to the skillet. Mix well to combine and reduce heat to medium and allow vegetables to cook for 2-3 minutes until soft. 6. Cook the noodles. Add the fettuccini noodles to the pot of boiling water. Use a large wooden spoon to stir the noodles and prevent them from sticking together. Cook until al dente. 7. Finish the sauce. As the noodles are cooking, mix in the granulated sugar with the tomatoes and stir in the chicken broth. Increase heat to high and allow mixture to come to a simmer. Cover and reduce heat to low. Cook for approximately 5 minutes before removing the lid and stirring in the cream, butter, and adding the shrimp and sausage back to the pot. Allow everything to cook for 3-4 minutes, but do not boil the cream sauce. 8. Add the noodles to the sauce. Finally, the cooked noodles and shredded parmesan cheese in with the sauce, adding reserved pasta water, as needed. Can you make this pasta meat free!? Yes, it’s totally possible. Just ditch the meat. Can you make it vegan? I will never say no because I’m sure there is a way to make a pasta that is just as creamy and delicious without animal products. Unfortunately, vegan food is not my specialty (I love cheese far too much). Ok, since we’re on the subject- gluten free? Yes. Totally. Just swap the pasta for your favorite gluten-free alternative and double check that your Cajun seasoning blend (or sausages) doesn’t have any hidden gluten in there somewhere. Otherwise, you are good to go. If you think you may have leftovers, store the sauce and noodles separately (if possible). To reheat, add a little extra broth or water to the sauce as it will thicken considerably in the refrigerator. Cajun seasoning is already quite salty. As such, I don’t recommend that you add much additional salt to this recipe. 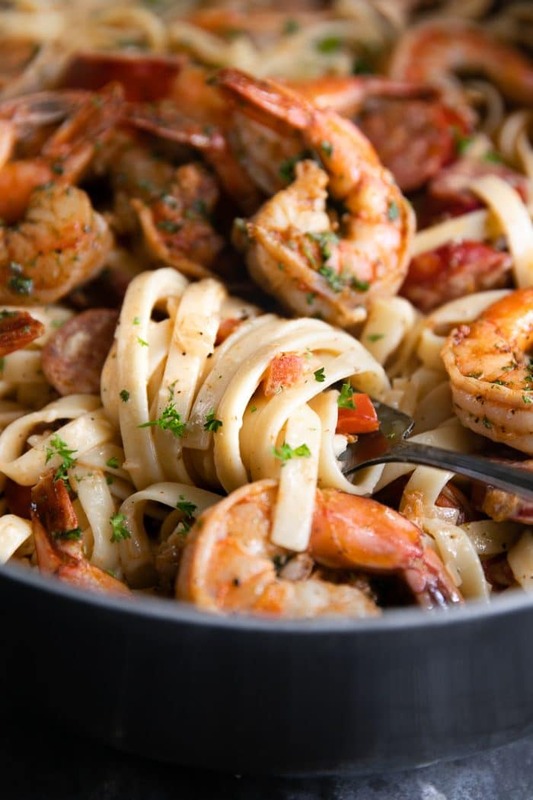 If you try making this Cajun Shrimp Pasta Recipe, please leave me a comment and let me know! I always love to hear your thoughts. 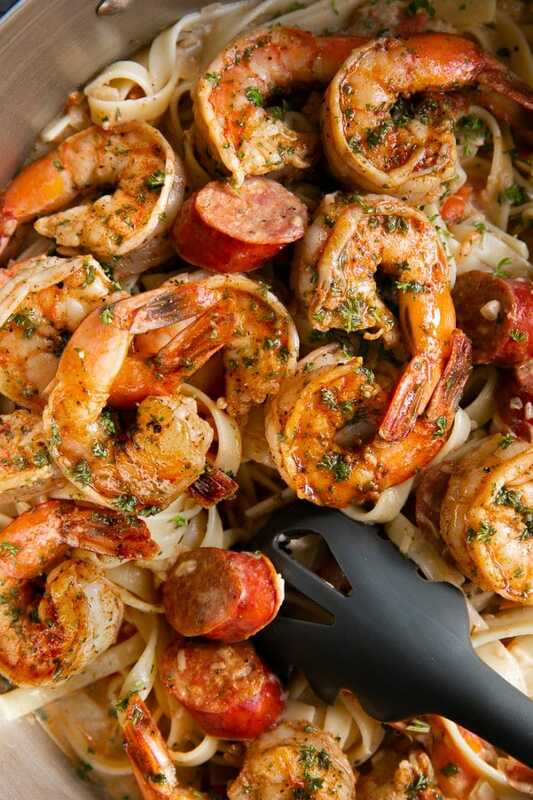 And don’t forget to pin and share this Cajun Shrimp Pasta and share it with your family and friends! Add the shrimp to a medium mixing bowl and drizzle with 1-2 tablespoons of olive oil, Cajun seasoning, and dried oregano. Mix well to combine. Set aside to cook the sausage. Heat a large cast iron skillet over high heat. Drizzle with approximately 1 tablespoon of olive oil swirling to coat the bottom of the skillet. Add the sausage in a single layer and cook each side for approximately 2-3 minutes. Remove the sausage to a clean plate and set aside. Return skillet to medium-high heat. Add an additional drizzle of olive oil, if needed, and add the shrimp to the skillet in a single layer. Cook each side for approximately 1-2 minutes, or until just cooked or just nearly cooked. Remove from the skillet to a clean plate and set aside. As the water boils, return the skillet to medium heat. Add a bit more olive oil and the onions to the skillet. Mix well and cook the onions for 3-4 minutes, stirring often. 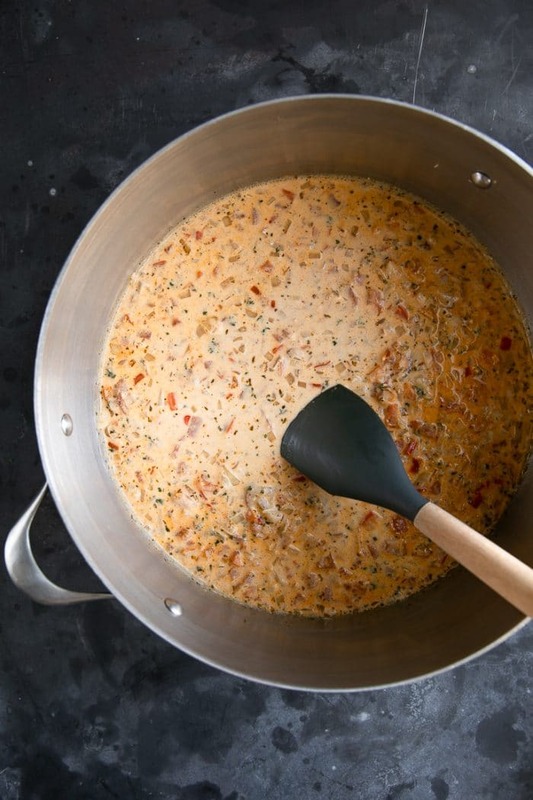 Add the diced bell pepper and continue to cook for an additional 2-3 minutes, stirring often. Add the garlic and cook for 30 seconds, stirring continuously. Add the cajun seasoning and tomatoes to the pan. Mix well to combine. Meanwhile, add the fettuccini noodles to the pot of boiling water. Use a large wooden spoon to stir the noodles and prevent them from sticking together. Cook until al dente. Stir in the granulated sugar and chicken broth. Bring to a boil and reduce heat too low. Cover and simmer for approximately 5 minutes. Stir in the heavy cream and butter and add the shrimp and sausage back to the pot. Increase heat to medium and bring to a simmer- do not boil the cream. Stir in the cooked fettuccini noodles and shredded cheese, adding reserved pasta water as needed to thin the sauce.